Back in the 1960s, the Batman TV series became an overnight sensation. 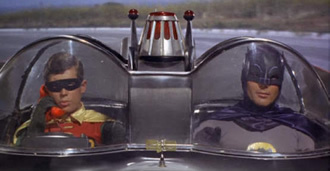 The country went literally Bat-crazy over the colorful, campy series and its stars — Adam West as the caped crusader and Burt Ward as Robin the boy wonder. Both West and Ward found themselves typecast when the Batman fad and series ended. It was extremely difficult for them to land new acting jobs with the exception of occasional Batman-related projects. They lent their voices to The New Adventures of Batman animated series in 1977 and that lasted a year. There were a pair of live-action superhero specials in 1979 that half-heartedly tried to recapture the spirit of the 1960s series but they were neither adventurous nor funny. West voiced the caped crusader as part of the Super Friends shows in the 1980s. Both West and Ward poked fun at their old show in the light-hearted Return to the Batcave TV movie in 2003 (based partially on the actors’ autobiographies books). Should Adam West be offered a role in the next Batman movie? Ward essentially left acting for other pursuits, most notably his Gentle Giants canine rescue charity. West has stuck it out and, like Star Trek’s William Shatner, has found renewed interest in his career. He’s appeared on sitcoms like George Lopez, become a semi-regular on FOX’s Family Guy and has lent his voice to a lot of other animated projects, some Batman-related and some not. One of West’s recent projects is the upcoming Super Capers movie. It’s a comedy that follows the exploits of a superhero wannabe (Justin Whalin from Lois & Clark: The New Adventures of Superman) who teams up with a group of misfit heroes to uncover an evil plot. The movie also features several other veterans of cancelled shows like Danielle Harris (Father of the Pride), Christine Lakin (Step by Step), John Polito (Homicide: Life on the Street), June Lockhart (Lost in Space), Clint Howard (The Andy Griffith Show), George Stults (7th Heaven), and Tom Sizemore (China Beach). 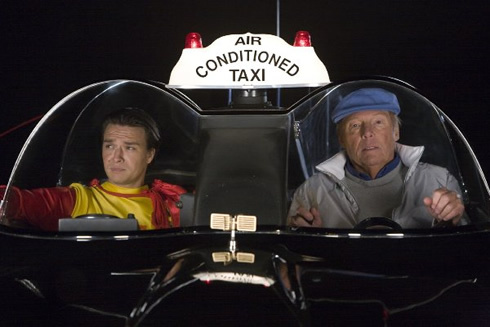 Wearing familiar shades of gray and blue, you can see West (with Whalin) playing the cabdriver of a very familiar automobile. The movie doesn’t have a release date yet but is expected sometime this year. For updates visit the official website. UPDATE: The movie will be released in selected cities on March 20, 2009. YouTube author “silvernemesis” has compiled an enjoyable and pretty comprehensive account of West’s history with the Batman character. Take a look! Batman image courtesy 20th Century Fox. Super Capers image courtesy RG Entertainment, Ltd.